Line a roasting tin with some aluminium foil. Layer up your ingredients in the bottom of the tin, firstly the onion, then apple, sprinkle over the sage and garlic. Place your pork chops on top. Drizzle over the lemon juice. Spread about a tsp of mustard over each of your chops (if they are large you may need more than is stated above), then drizzle the honey and the olive oil over the chops as equally as you can. Sprinkle some salt and grind some black pepper over them too. Put your chops in the oven and roast for about 10 to 15 minutes. The chops are ready when they are nice and crisply brown and the meat is no longer pink. I check this by inserting a knife into the thickest part of the thickest chop to look inside – you can always disguise this by pulling a little of the mustard over your cut. 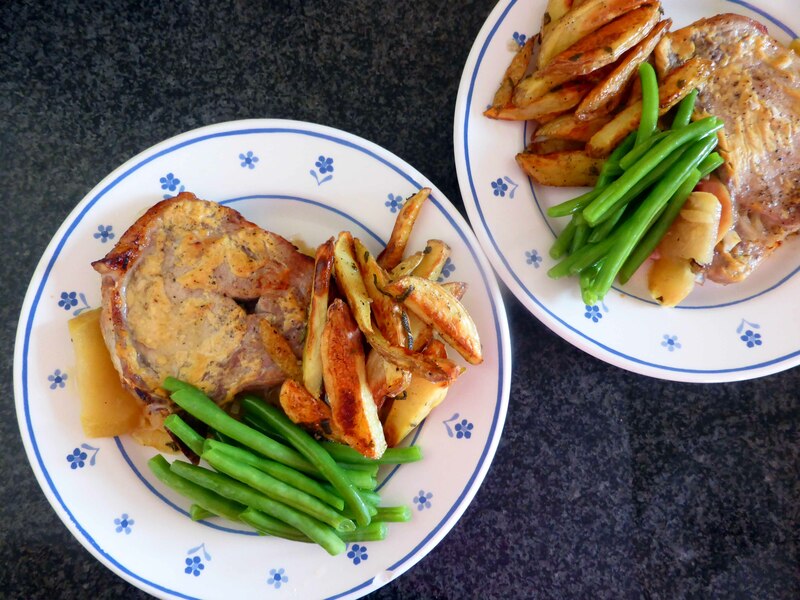 This delicious recipe incorporates all my favourite flavours to combine with pork (apples, onions, mustard, honey) in one roasting tray. Its easy, quick and there's only one pan to wash up - what could be more practical than that? ?